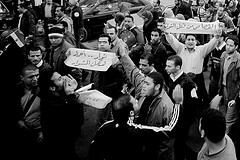 Demonstrations again filled Egypt’s streets on 27 January 2012, in a show of anger against the ruling military council. Enormous protests on 25 January filled Tahrir Square and cities across Egypt, dominated by chants for the end of military rule. Groups of workers have been prominent in the streets, with dozens of factories announcing before 25 January that they would be mobilising for the protests. Workers at the Indorama mill in Shibin al-Kom decided at a meeting on 21 January they would demonstrate on 25 January following the failure of negotations with the government to solve the crisis at the company. After a long-running campaign by workers, including large numbers of strikes, a court ruled that the privatisation of the company should be overturned, but the government has so far refused to implement the decision. Alexandria recently saw a strike by port workers against their military management. Thousands marched in an angry demonstration, shouting “down, down with military rule”. January 27, 2012 in Egypt, Latest News, Manufacturing, Strike reports, Transport.